The Mackenzie Region is home to many holiday parks and managed campgrounds that offer all the amenities (spacious kitchens and hot showers!) plus a beautiful spot to park up for the night. Find these affordable and welcoming campgrounds by selecting “holiday park” on our accommodation page. Freedom camping is permitted on council-controlled land in the Mackenzie District, with some restrictions. Find popular freedom camping spots using CamperMate, a free website and travel app with detailed information on camping throughout New Zealand. Freedom camping is defined as camping outside of a designated campground in a location that does not provide camping facilities (such as toilets). Because the Mackenzie is a unique and fragile environment, there are rules around freedom camping to protect our region for its residents, visitors and future generations. To freedom camp in the Mackenzie District you must have a camper with fully self-contained toilet facilities. To qualify, the camper’s toilet must be readily usable at all times, even with the bed made up. Your camper must also meet your ablution needs for a minimum of three days without requiring discharge of waste and without the occupants relying on external facilities. Download the Mackenzie District Council freedom camping brochure. Freedom camping is prohibited in Tekapo township, the commercial centre of Twizel, and along the western shore (known as the lagoon area) of Lake Ruataniwha in Twizel. Freedom camping is also prohibited in Aoraki Mount Cook National Park. Please note that campers can stay a maximum of three consecutive nights in these locations, and they are prohibited from camping within 20 metres of the lake shore. 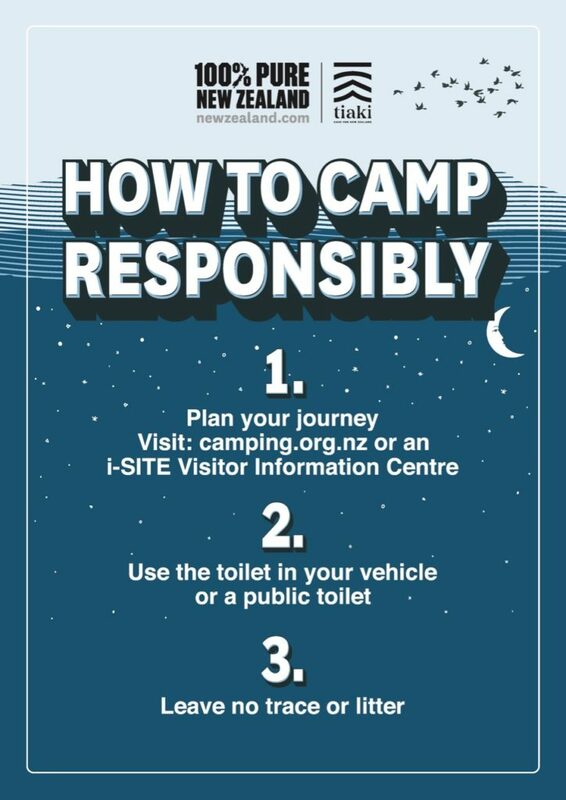 All independent overnight/freedom campers must behave in an acceptable manner while camping in the Mackenzie Region. To learn about camping etiquette all around New Zealand go to Camping Our Way. The Mackenzie region is a zero-waste district. All rubbish must be sorted to ensure that the majority of waste can be recycled. Rubbish bags are available for purchase at supermarkets in Lake Tekapo and Twizel, the Council offices in Twizel and Fairlie, and Fairlie House & Garden. Rubbish bags can be dropped off at the Resource Recovery Parks in Fairlie, Lake Tekapo and Twizel. More info here.